You are here: Home / Money Saving Tips / Being a Smart Consumer / How to Keep Food Fresh Longer: Save $100’s Every Month! By doing a few simple tricks and keeping your fridge stocked properly, you will be throwing away less food and saving money to spend on things you actually enjoy. First and foremost, you want to have your fridge set to the correct temperature of 37-40°F to keep your food fresh longer. Moisture is the enemy when it comes to keeping your produce fresh. It’s best to wash your produce right before you eat it but if you want to go ahead and wash them to make things easier on you or the kids, make sure you dry everything completely before storing them in the fridge. Another great way to combat moisture is to line your refrigerator drawers with paper towels. They will help soak up any excess moisture in the air while also making any clean up easier. To prevent food from going bad, the first thing you need to know is what should be stored in the fridge and what should be left out. If you need some storage containers for your produce, the Rubbermaid FreshWorks Containers are an affordable option. Keep apples away from other produce, they emit ethylene gas which will cause other produce to spoil quicker. If you just need a little lemon juice, poke a hole in the lemon with a knife and just squeeze out what you need, then cover with plastic wrap and store in the fridge. Berries: Take out any berries that may be about to spoil and eat them right away. Move the remaining berries to a shallow container and loosely cover with a clean towel. Bananas: Keep the bananas in a bunch to keep fresh longer. Wrap the stem with plastic cling wrap. Pineapples: They can be stored on the counter or in the fridge. Store upside down for a day or two before cutting to let the sugar spread from the base through the whole fruit. To keep potatoes from sprouting, place an apple in the bag and store in a dark area of your pantry. Leafy Greens: Make sure they are completely dry before storing them in an airtight container lined with paper towels. If you need to revive some of the leaves, plunge them into an ice bath with a squirt of lemon. Mushrooms: To keep them from getting slimy, store in a brown paper back toward the back of the fridge. Tomatoes: Store tomatoes on the counter with the stem side down. Celery: To prolong the life of celery, wrap in aluminum foil and store in the refrigerator. Fresh Herbs: to keep food fresh longer, treat them like a bouquet of flowers. Trim the cut ends and place in a jar of water. You can store most in the fridge like this but Basil needs to be left on the counter. Squash: To keep it fresh, coat with a thin layer of vegetable oil and store in the pantry. Asparagus: Store in the refrigerator, standing upright in a glass of water with a damp paper towel draped over the tops. Store eggs in their original carton in the fridge, not in the door of the refrigerator. If you aren’t going to eat any fish or meat that you bought within 1-2 days, put in a plastic freezer bag and freeze until the day you will be eating it. To keep pastas, cereals, pretzels, etc fresh longer, store in airtight containers in your pantry. store brown sugar in the freezer to keep it from hardening. 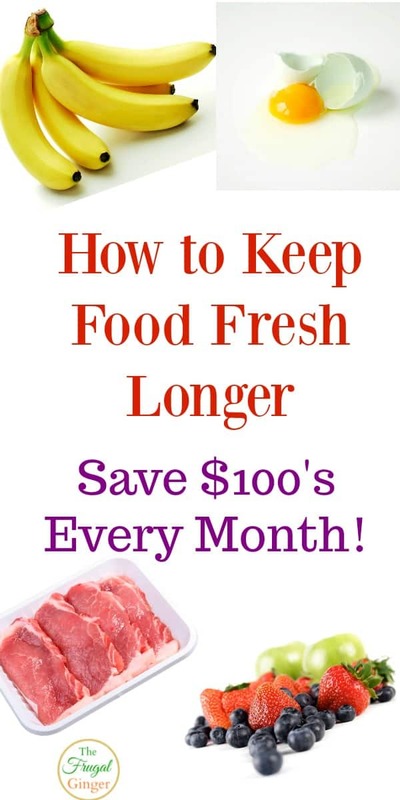 By using these tips to keep food fresh longer, you should be able to save $100’s if not $1,ooo’s of dollars each year. 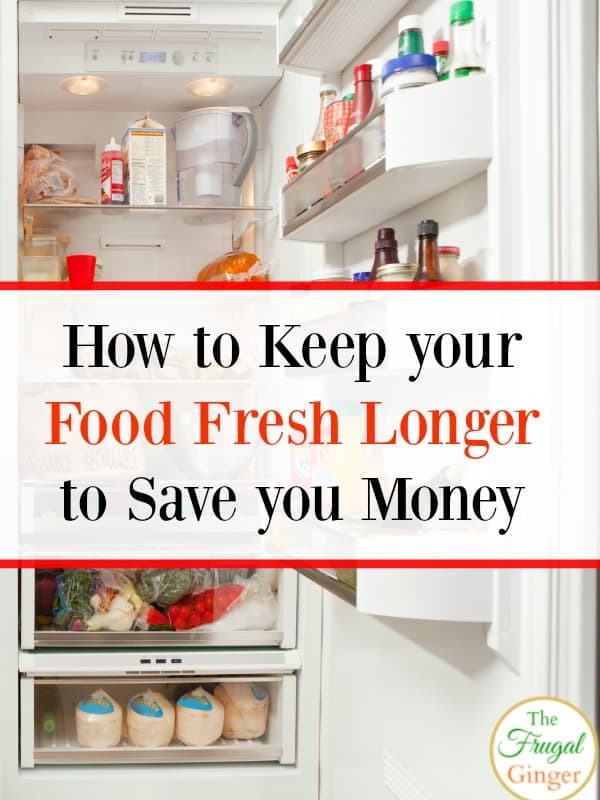 Let us know of any other ways you keep your food fresh longer in the comments below. I would love to hear what works for you! 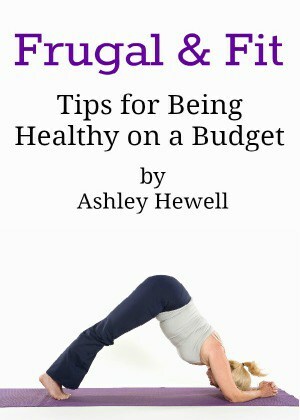 These are such helpful tips! I hate how much food we waste because it goes bad before we can use it! Not only is it wasteful it costs a lot of money! One thing that has been a game changer for me is soaking strawberries in a mixture of vinegar and water. It makes them last days longer!